^ Cant, NB (Jun 15, 2003). “Parallel auditory pathways: projection patterns of the different neuronal populations in the dorsal and ventral cochlear nuclei”. Brain Res Bull. 60 (5-6): 457-74. doi:10.1016/S0361-9230(03)00050-9. http://www.sciencedirect.com/science?_ob=ArticleURL&_udi=B6SYT-482YJ98-M&_user=1458830&_coverDate=06%2F15%2F2003&_rdoc=1&_fmt=&_orig=search&_sort=d&view=c&_acct=C000052790&_version=1&_urlVersion=0&_userid=1458830&md5=1de05023dc9cefd1b22fcc993ef3d4aa. ^ Bendor, D; Wang, X (2005). 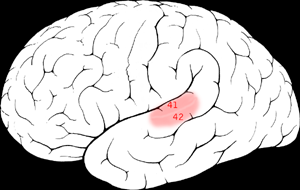 “The neuronal representation of pitch in primate auditory cortex.”. Nature 436 (7054): 1161-5. doi:10.1038/nature03867. http://www.nature.com/nature/journal/v436/n7054/full/nature03867.html. ^ Zatorre, RJ (2005). “Neuroscience: finding the missing fundamental”. Nature 436 (7054): 1093-4. doi:10.1038/4361093a. http://www.nature.com/nature/journal/v436/n7054/full/4361093a.html. ^ Klinke, Rainer; Kral, Andrej; Heid, Silvia ; Tillein, Jochen ; Hartmann , Rainer (Sep. 10, 1999). “Recruitment of the auditory cortex in congenitally deaf cats by long-term cochlear electrostimulation”. Science 285 (5434): 1729-33. doi:10.1126/science.285.5434.1729. http://www.sciencemag.org/cgi/content/abstract/285/5434/1729. ^ Strickland (Winter 2001). “Music and the brain in childhood development”. Childhood Education 78 (2): 100-4. ^ Bertrand, O.; Tallon-Baudry, C.; Fischer, C.; and Pernier, J.. Object representation and gamma oscillations. http://biomag2000.hut.fi/papers/0001.pdf. ^ Knief, A.; Schulte, M.; Fujiki, N.; and Pantev, C.. Oscillatory Gamma band and Slow brain Activity Evoked by Real and Imaginary Musical Stimuli.